All-inclusive pond bubbler deicer packages suitable for protecting docks, boathouses, seawalls, boat lifts and houseboats. 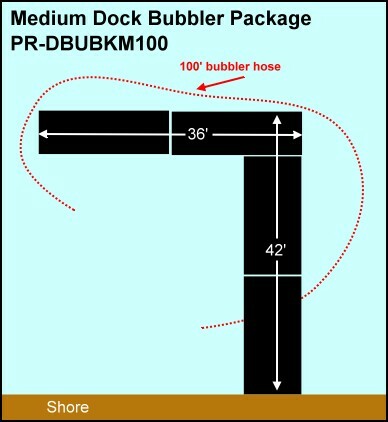 Dock Bubblers use a weighted bubbler hose or de-icer diffuser tubing to create surface agitation and keep structures from being locked in the ice. 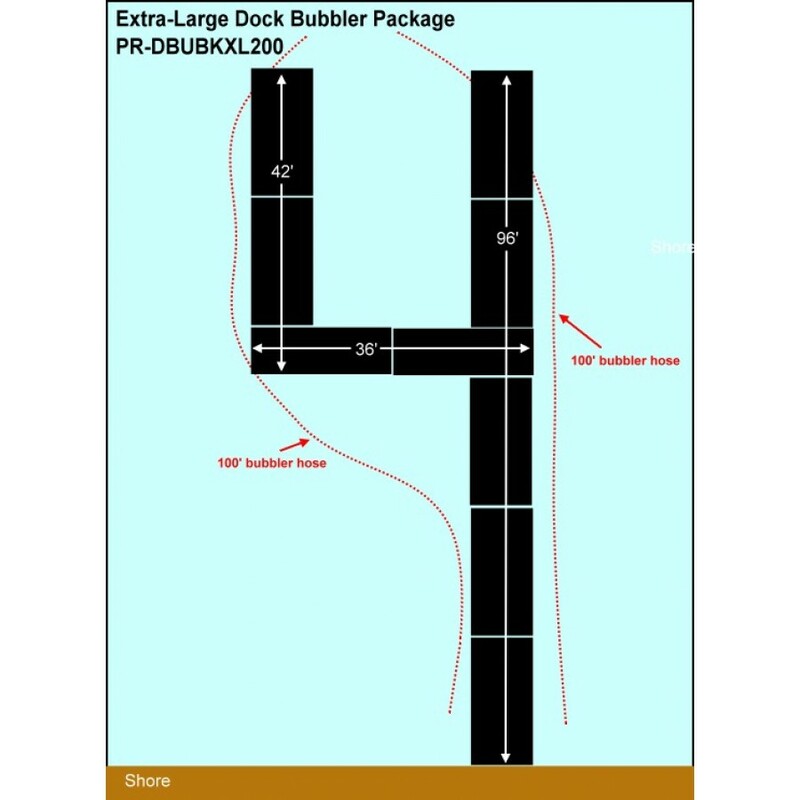 A dock bubbler typically keeps a smaller area open in the ice than a submersible motorized propeller type of deicer and this is attractive to dock owners living on shared bodies of water when neighbours might not want thin ice near their property. 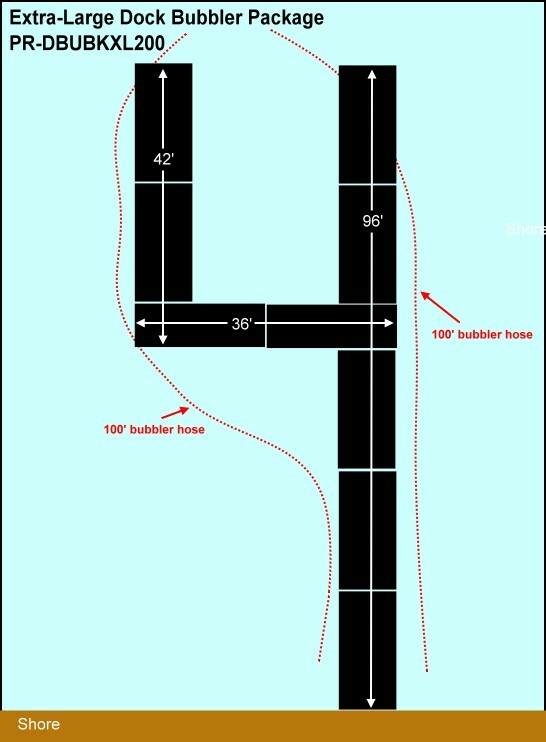 In most situation the weighted bubbler hose is placed at the far end of the structure you are trying to protect, ie: the deepest part. Bubblers will work in todal waters as well or in lakes that lower the water levels during winter. 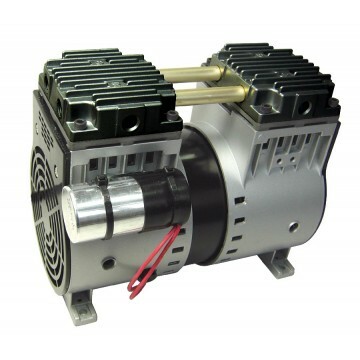 Step 1 : Install the compressor in your boathouse or shed. Build a simple wooden box if you don't have a nearby shelter handy. The compressor can be screwed to a piece of 3/4" plywood to hold it steady. Some folks put the compressor under a RubberMaid style of plastic container with some holes for ventilation. 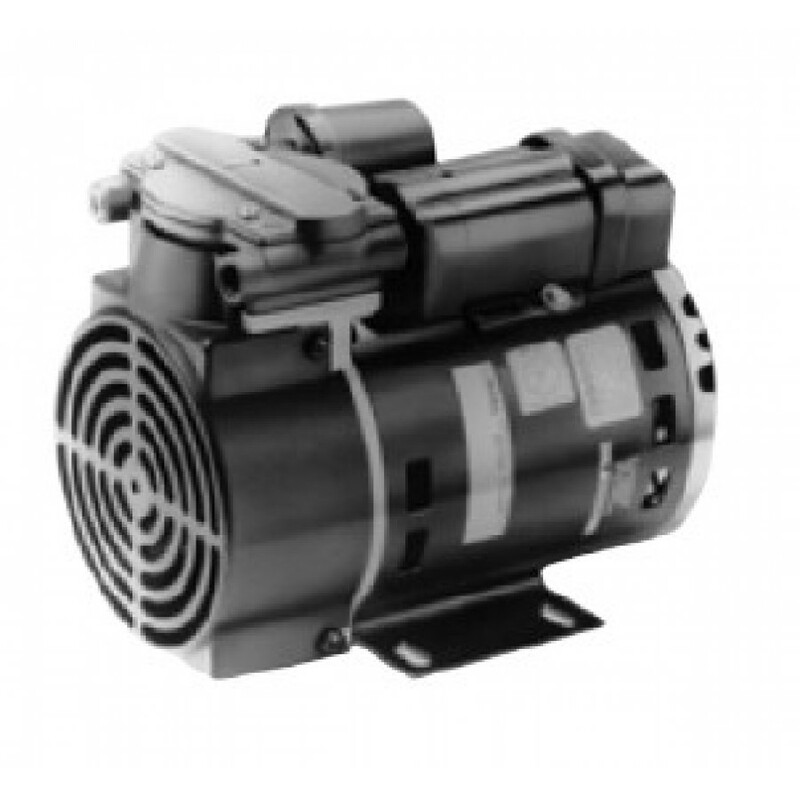 Just make sure the compressor is dry and out of snow and sleet and rain. Step 2 : Connect the weighted airline to the valve outlet that is supplied with the compressor. Tighten clamps firmly but do not overtighten. Step 3 : Connect the weighted self-sinking airline to the bubbler tubing. Do not bend the bubbler hose sharply as it can kink; instead of trying to make a 90 degree bend around a certain piling or footing use gentle angles with the tubing so the airline doesn't kink or split. The lead keel of the bubbler tube can be cut with metal shears. Make sure the end of the bubbler tubing has the plug inserted in the end! If you do want to make your bubbler wrap tightly around corners cut the tubing and use a 90 degree 1/2" barbed plastic insert to connect two pieces at the corner. line during submersion helps ensure your placement is correct as you can follow the bubbles at the surface and ensure the water movement is uniform. 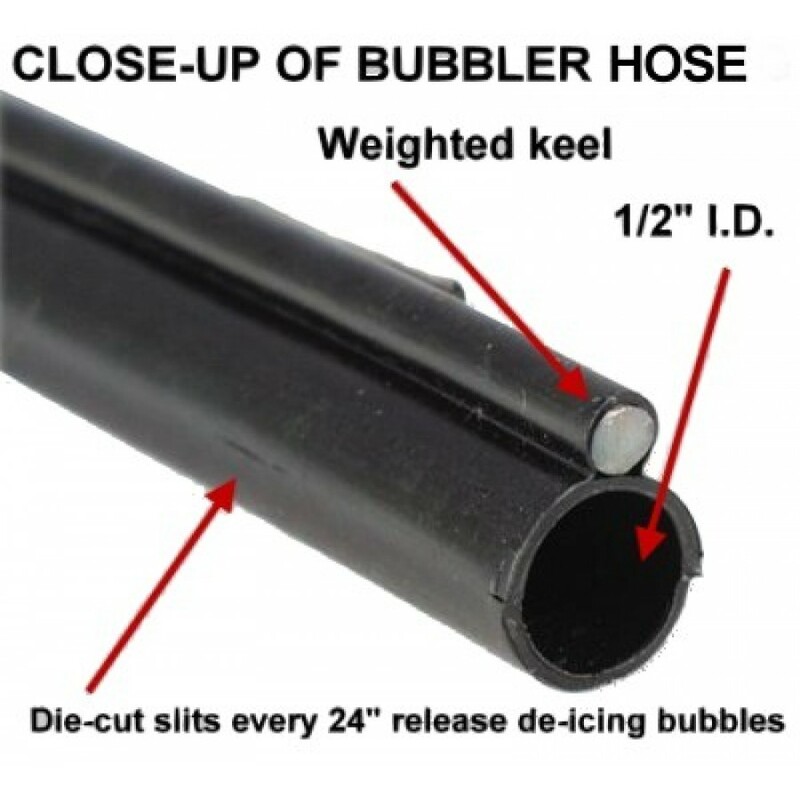 You want to see bubbles all along the entire length of the bubbler hose, if there is an issue with the installation you will quickly see the evidence: kinks in the bubbler hose will cause the airflow to stop before it reaches the end of the bubbler hose. Step 5 : Install the diffuser bubbler dock de-icer tubing in a line around the area you want to keep free from ice. Usually the tubing, which is weighted, is placed on the outside edge of the structure you are trying to protect. If it is possible the tubing should be kept on a fairly consistant depth or you will lose bubbles in deeper zones. 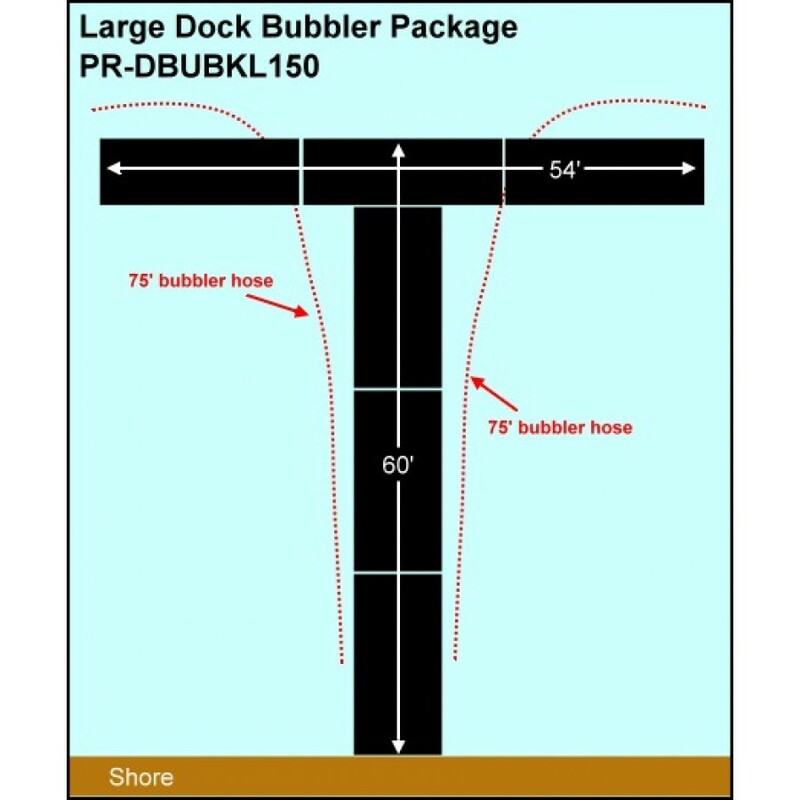 The tubing can also be attached to the pilings of the dock or fixed to suspended stakes which are attached to the dock to ensure the tubing is at a fairly consistant depth. 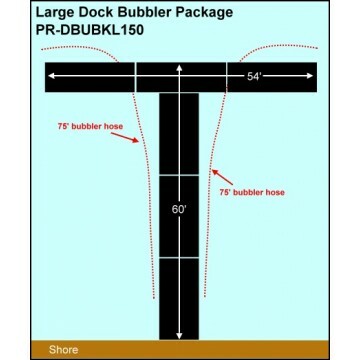 To compensate for differences in depth you can also connect your air feeder line to the bubbler hose at the deepest part and have the plugged end of the bubble tubing in the shallowest area; this often requires more feeder line if your compressor is located on shore but it can help. When in doubt, remember it is better to install your bubbler in July and not October...even with waders on you won't find many volunteers to install your dock bubbler in November! 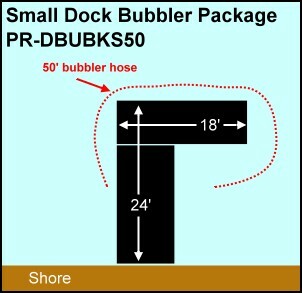 A depth difference of a few feet won't matter but avoid putting one end of your dock bubbler hose in very shallow water and the other end in very deep water. A small depth differential won't matter too much but keep it in mind when sizing out your system. It sometimes can be better, especially if you have deeper waters, to use shorter lengths of bubbler tube. 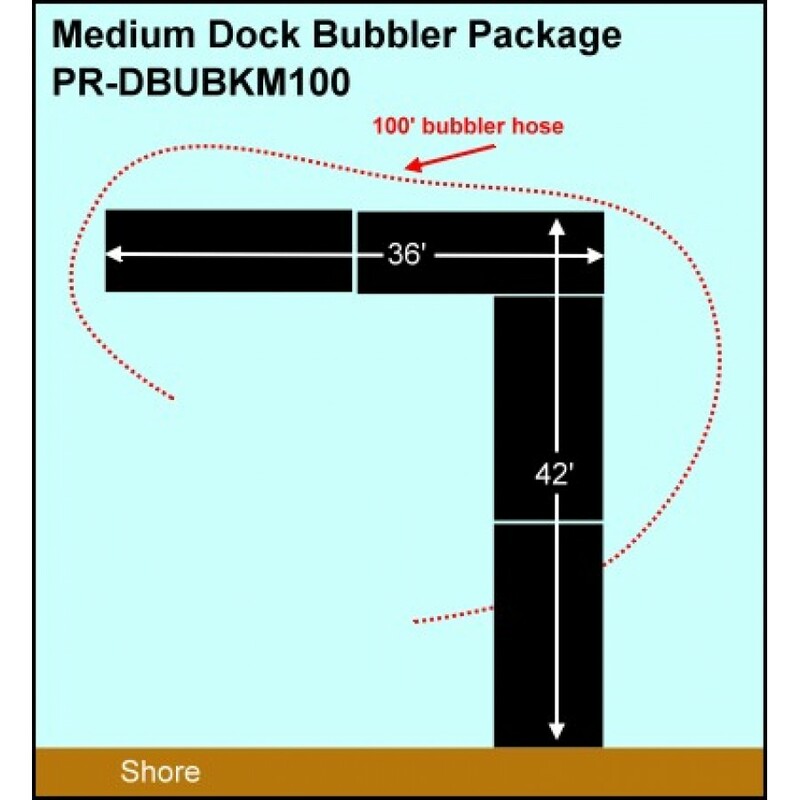 Strapping the tubing to your pilings or footings is an easy way to make sure the depth is relatively constant. Extra weighted feeder line available. When installing the extra-large bubbler system, which has a compressor with two air outlets, you may choose to run a single 200' line of bubbler hose and feed air into the tubing from both ends instead of running two separate 100' bubbler lines.